Basement Ranch,Residential, Traditional - Maryville, TN GO TO: WWW.181INDIANSHADOWS.COM FOR MORE INFORMATION AND MORE PHOTOS ALL IN ONE CONVENIENT LOCATION INCLUDING A 3D VIRTUAL TOUR AVAILABLE 24/7! 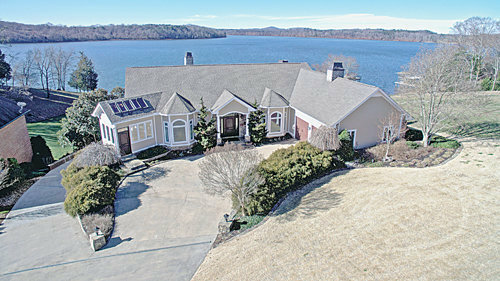 Imagine yourself living in this luxury lake front home in the shadow of the Great Smoky Mountains, on Tellico Lake, 15,560 acres of scenic beauty and aquatic adventure, in the 9 Lakes Region of East Tennessee.It's easy to see why so many people are choosing East Tennessee for retirement and/or second homes. The natural scenic beauty, active outdoor adventure coupled with a distinct yet temperate four-season climate plus the cultural, historic, educational and social opportunities provided by Knoxville, Tennessee's third largest city, make the area quite attractive. Add outstanding affordable healthcare plus a low cost of living index and the prospect you will thoroughly enjoy life on Tellico Lake becomes evident. The Harbour Place neighborhood is located on the peaceful southern end of Tellico Lake with clear waters and a majestic scenic backdrop provided by the Great Smoky Mountains, and yet is only 30 minutes away from the friendly small towns Maryville and Alcoa that feature shopping, fine eateries, a four year college with the Clayton Arts Center (where you can see a play or hear musical concerts by famous entertainers) and the Knoxville McGhee Tyson Airport providing major airline service to wherever your business or vacation plans require.